The Wolf Hunting Group, a special Beijing police squad formed to crack down on sexual harassment on the city's subways, has caught 40 suspects and detained 28 since the group being established in June. However, the group has found it hard to secure convictions as persuading victims to testify is challenging. "Chinese society has a tradition of criticizing victims. It is essential for society to encourage victims to speak out," Luo Ruixue, a member of the Women Awakening Network, a women's rights group, told the Global Times on Tuesday. "Do you know why we seized you?" "Because I touched a girl's thigh on the subway." A suspect was detained by the Wolf Hunting Group of Sihui Police Station on August 11, The Beijing News reported. Founded on June 16, the squad has caught 40 people suspected of sexual assault on subway and detained 28. "We must act in order to provide a safe ride and give passengers the secure feeling that they should have in public," Wang Yongchao, vice director of Sihui Police Station, told the press. "Perverts look no different to normal people in general, but their eyes are different. Their eyes usually glance around and they are alert and diffident," said Liu Xiao (pseudonym), a member of the Wolf Hunting Group. Liu has been tracking down sexual assaulters for 10 years and says he can recognize them by their "smell." Each morning, Liu and his colleagues dress in plain clothes and patrol subway platforms. "We solve every case we can and catch any pervert we see. In the long term, we hope to build up a reputation," said Wang Cang (pseudonym), a group member. According to the Beijing News report, lots of women have told their stories of being sexually harassed on Beijing's public transport systems. However, since there is rarely a lot of evidence, it has been difficult to put offenders behind bars. Officers say that the biggest barrier is the reluctance of victims to cooperate with police investigations. Wang said that some victims say things like "I'm busy, please do not bother me anymore. You are violating my personal freedom." Liu said that after he catches molesters on the subway, more than 80 percent of victims refuse to provide evidence, which means the suspects have to be freed. According to the group's members, harassers share their experience of assaulting women and alert each other to avoid the police. They also have social media groups in which they share themselves experiences and videos of their harassing women, news website thepaper.cn reported. "Many of the victims are afraid of being criticized or facing revenge, so they dare not speak out at the time or call the police when harassment happens," Luo said. A man cut a woman's throat with a knife on a bus in Beijing's suburban Tongzhou district in July after the woman said he was harassed by the man and took a picture of him, China National Radio reported. Also, China has a tradition of blaming victims, which still occurs in the media and on the Internet, said Luo. 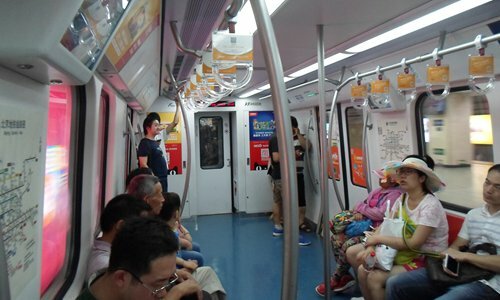 If a victim speaks out or a bystander offers a helping hand, they could find themselves at the center of the case and have their actions discussed by others, but no one wants this, a Beijing subway passenger surnamed Zhang told the Global Times on Tuesday. "As the genders are not truly equal, the weak ones (usually the females) are not allowed to mention their experience, otherwise it would cause them trouble in maintaining the patriarchal society," Luo noted. However, according to the Women Awakening Network, speaking out might actually be safer for the victims. "Detention is serious, but more important is the presence of the police that could deter perverts and encourage victims to fight for their own rights," Luo said. A positive sign is that society and the police are paying more attention to sexual harassment in the public, and posters have been put up in the subway as well to encourage victims to speak out, Luo said.